Lundy Wins and Ennis Stays unbeaten at 12-0 in Philly Friday! Peltz Boxing, BAM Boxing and RAGING BABE returned once again to the 2300 Arena in South Philly with veteran “Hammerin” Hank Lundy’s return to Philly for the first time since 2010. Top Philly prospect Jaron “Boots” Ennis increased his unbeaten win streak to 12. 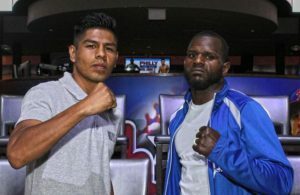 In the main event Lightweight “Hammerin” Hank Lundy, 28-6-1 (14), of Philly, scored a knockdown and stopped late substitute Dany Evangelista, 20-8-2 (16), of Mexico City, at 2:53 of the fifth round in a scheduled 8. Lundy easily won the first two rounds ending the last part of the second round switching to southpaw. In the third round Lundy landed a solid left hook to the head of Evangelista stunning him. Evangelista landed his best punch so far in the fight a right to the midsection of Lundy and repeated it at the bell. In the fourth round while in close Lundy landed a double left hook to the head of Evangelista. In the fifth round Evangelista landed a solid lead right to the head of Lundy. Lundy looked angry from that and came back with a flurry of punches dropping Evengelista and causing a cut over his left eye. He got up but didn’t respond when referee Gary Rosato asked him to raise his hands so he stopped it. In co-feature super welterweight Native American Mark Daniels, Jr., of Crandon, WI, 3-1 (1), suffered his first loss when Isaiah Wise, 5-1 (3), of Philly, used a good body attack for all 6 rounds to take the decision. In the opening round Daniels had his way halfway thru until Wise landed several good body shots with left hooks. In the second and third rounds Daniels switched back and forth southpaw to orthodox but it didn’t matter to Wise who continued going to the body. In the fourth round Wise landed a solid lead right to the chin of Daniels that stunned him. Daniels came back causing a small cut over the right eye of Wise. In the fifth round Daniels got in his best punch of the fight a left hook to the chin of Wise who came right back with a combination to the body of Daniels. In the sixth and final round Wise continued with a body beating. Judge’s Poturaj and Lundy had it 59-55 while Kinney had it 60-54 as did this writer. Referee was Rosato. Top Philly welterweight prospect Jaron “Boots” Ennis, 12-0 (10), scored his twelfth straight win in fourteen months stopping Wilfredo “El Zurdo” Acuna, 16-21 (12), of Managua, NIC, with a pair of knockdowns at 1:23 in the first round. In the opening round Ennis switched from orthodox to southpaw against the southpaw Acuna and dropped him with a right hook to the chin. Acuna got up and was dropped by a vicious right to the mid-section and counted out by referee Talmadge. “I always come out orthodox but switched to southpaw and will be back June 17th in Baltimore (per Victory Promotions Chris Middendorf),” said Ennis. In his corner as usual was his father/trainer “Bozy” Ennis. Middendorf and manager Cameron Dunkin have done a fine job keeping Ennis who will turn 20 this month busy. In the walk out bout cruiserweight Alvin “Iron Majik” Varmall, Jr., 11-0-1 (9), of Catskill, NY, with a pair of knockdowns destroyed Juan Reyna, 6-7-1 (2), of Brownsville, TX, at 2:02 of the first round. In the opening round Varmall came storming out with solid body work chasing Reyna. An overhand right near the back of the head by Varmall dropped Reyna. A vicious body attack and down went Reyna forcing referee Blair Talmadge to wave it off. Super lightweight Scott Kelleher, 5-1 (3), of Philly, back from a 13 month layoff was dropped 3 times losing to Dion “Showtime” Richardson, 2-1 (1), of Newark, NJ, at 2:19 of the first round. In the opening round a right hand from Richardson almost put Kelleher through the ropes causing a knockdown by referee Rosato. Shortly later another right hand dropped Keller down. Before the end of the round Richardson had Kelleher all bloody and down for a third time as referee Rosato waved it off. It was reported Kelleher suffered a broken nose. In a good featherweight scrap Crystian Peguero, 2-0 (1), of Philly, scored a hard fought decision over Saquan “Roto Rooter” Felton, 0-2 (0), of Rochester, NY, over 4 rounds. In a close first round Peguero came out looking for another early knockout as he did in his debut but Felton was having none of it. In the second round things heated up with both boxers landing well and sometimes landing at the same time to the chin. In the third round a short right by Peguero to the chin of Felton had him holding on. In the fourth and last round both let it all hang out with the shorter Peguero scoring well but not well enough for a knockdown or knockout. Judge Lundy had it 39-37 while Poturaj and Kinney along with this writer had it 40-36 for the winner. In the opening bout super welterweight Ishmael Altman, 0-0-1 (0), of Arapahoe, NC, got the short end of the stick drawing with Tyree Crowder, 0-0-1 (0), of Philly, that ended in a disputed draw over 4 rounds. In the first two rounds it was all Altman being taller and using his reach chasing Crowder. In the third round Altman continues using his jab with Crowder countering. In the fourth and final round Altman seemed to post a shutout. Referee was Rosato. Judges Lundy, Poturaj and Frisca all had it 38-38. This writer 40-36. In a rematch Marko Bailey, 5-0 (3), of Durham NC, won by majority decision over southpaw Vinnie Denierio, 1-2 (1), of Geneva, NY, over 4 good rounds of boxing. In the first round it was Denierio controlling with a jab and an occasional straight left to the chin of Bailey who was chasing him. In the second round Bailey got a couple of right’s to the head in but Denierio outworked him. In the third round Bailey knowing he may be behind in the scoring aggressively went after Denierio. In the fourth and final round it was all Bailey halfway through the round when both exchanged uppercuts to the chin. Bailey seemed to earn a draw taking this round. Judges Kinney and Poturaj had it 39-37 while Frisca and this writer 38-38. Referee was Rosato. Welterweight Marcel Rivers, 2-0 (1), of Philly, scored a knockdown in winning a decision over Jamaal “Shoota” Gregory, 1-0 (1), of Charlotte, NC, over a spirited 4 rounds. In the opening round both boxers mixed it up well. In the second round Rivers knocked the mouthpiece of Gregory out twice. Gregory did get the last punch in at the bell. In the third round an overhand right from Rivers to the chin of Gregory dropped him. Gregory got up and fought back to a stand still with Rivers. In the fourth and final round the taller Gregory came back in the best round of the fight to take the round. Referee was Blair Talmadge. All 3 judges and this writer had it 39-36 for the winner. In attendance were former Philly world champions “Joltin” Jeff Chandler and Bernard “Be-Hop” Hopkins. It was a sell-out crowd! Jaron “Boots” Ennis Seeking Tenth Win in Eleven Months Friday! 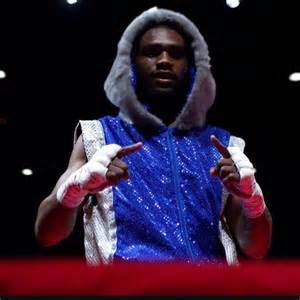 Jaron “Boots” Ennis, 9-0 (8), the hottest prospect out of Philadelphia since the 1984 Olympic Gold Medalist Meldrick Taylor will be headlining at the 2300 Arena in South Philadelphia Friday on a Victory Boxing Promotions show. Ennis is looking for his tenth win in eleven months since signing with manager Cameron Dunkin who is currently managing super lightweight champion Terrence Crawford. “His career is going good and we are on the right track,” said Bozy Ennis (father and trainer).The 19 year-old Ennis is following in the footsteps of his brothers Derek “Pooh” Ennis, the former USBA super welterweight champion and Farah Ennis, the former NABF super middleweight champion. At Bozy’s Dungeon on Venango Street in North Philadelphia he’s been sparring with WBC contender “The New” Ray Robinson (whom Bozy trains), 23-2, Elijah Vines, 3-0, who will be on the show Friday, New York’s Steve Martinez, 17-3 (who is managed by Philly’s Brian Cohen) who will be on an April 7th show in Puerto Rico that Philly’s Hard Hitting Promotions is involved with and Kyrone “Shut It Down”Davis, 12-1, from Wilmington, DE, who won Tuesday on Fox Sports-1. Ennis turned professional in April of 2016 in St. George, UT, scoring a first round knockout in 0:42 on a Victory Boxing show, a first round stoppage in 0:23 in May in Philly at the PA Sheet Metal Workers Hall on a Hard Hitting show, in June in Springfield, VA, another first round knockout in 0:20, in July in Rio Rancho, NM, with a fourth round stoppage on a Victory Boxing show, in August at the Grundy Arena in Bristol, PA, on a D&D Promotions show scoring a second round knockout, in September winning his only decision at the 2300 Arena in Philly on a Peltz Boxing show, in November at the 2300 Arena in Philly with a fourth round stoppage over Chris Alexander, 4-2, in his first scheduled six round bout on a Victory Boxing show, in December at the SugarHouse Casino in Philly he scored a sixth round stoppage in a scheduled six, over Marcus Beckford, 3-4-1, on a Hard Hitting show and in January at the 2300 Arena on a Victory Boxing show scoring a first round knockout over Elvis Perez, 28-16-4, in 0:35. There were just five fights at weigh-in down from twelve bouts scheduled as of Thursday. Angel Pizarro, 2-0 (1), of Philly (trained by Bozy) was to meet Christopher Nelson of Louisville, KY but was not at weigh-in. Manny “Major Pain” Folly, 9-0 (7), who is a Philly policeman, Joshua Jones, 3-0-1 (2), Darren Goodall, 4-0 (3), and Brandun Lee, 1-0 (1). There are just 24 rounds with 52 shown on box rec? Five fights for $75.00 ringside? Doors open at 6pm and first fight scheduled at 7:00pm.